Scottish Salmon Company awards six-figure contract to Arran firm. 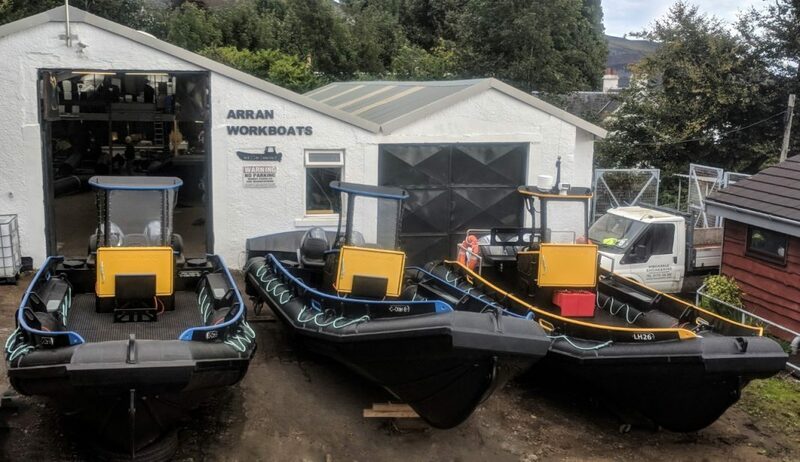 Kiscadale Engineering/Arran Workboats has been commissioned to build six new work boats for SSC, which will be delivered to SSC sites across the Outer Hebrides from Lewis to Mull between April and September this year, the company wrote in a press release. Over the past two years, SSC has taken delivery of nine boats from Arran Workboats, located on the island’s Whiting Bay. The vessels are used for essential tasks such as transportation around the sites. SSC wrote that the Isle of Arran has played a long-term role in SSC’s operations and its Lamlash Bay site, one of the first fish farms in Scotland, was established over 30 years ago. Historically a general plastic and stainless-steel fabricator, Kiscadale Engineering is now a marine fabricator on Arran. The business is run by husband and wife team Iain and Sandra Monteith. Arran Workboats’ Ian Monteith said: “With a history going back over 30 years of working with The Scottish Salmon Company at the Kingscross Farm on Arran, we are pleased to be awarded this contract. Multiple orders like this helps secure employment and provide training for local young people, this contract has allowed us to create one new role and also supports four workers who are under 30. SSC demand a very high standard for their boats and we have a well-trained workforce dedicated to building the best boats of their class.